The Eagles confirmed that they have interviewed their sixth applicant for their head coaching vacancy, one Mr. Thomas Coughlin. The five previous interviewees were (in chronological order): Eagles running back coach Duce Staley, Eagles offensive coordinator / interim head coach Pat Shurmur, Bears offensive coordinator Adam Gase (Gase was hired by the Dolphins to be their head coach), Giants offensive coordinator Ben McAdoo, and Chiefs offensive coordinator Doug Pederson. Shurmur, Gase, McAdoo, and Pederson were all former quarterback coaches in the NFL at one time in their respective careers, so Coughlin is the first Eagles candidate aside from Staley who does not have that on his resume. Coughlin's resume, however, spans a length of time longer than many of you have been alive. Coughlin has been coaching football since 1969, and he'll turn 70 in August. He has three Super Bowl rings, one as a wide receivers coach and two as a head coach, all with the Giants. His two Super Bowl wins as a head coach came with teams that were not nearly as talented from top to bottom as many other Super Bowl winners. No coach has ever won a Super Bowl with two teams, although that feels more like trivia than any sort of predictor that it will never happen. One of the themes in Jeffrey Lurie's post-Chip press conference was the next coach's ability to relate to and communicate with players. Coughlin had issues with that in the past, but he adapted to the modern athlete, and became a coach known for getting players to sell out for him. That could be a trait that interests Lurie. It is also interesting that the Eagles interviewed Giants offensive coordinator Ben McAdoo first. Could Lurie and the gang just be picking Coughlin's brain on McAdoo? Could they be considering Coughlin and McAdoo as a head coach / offensive coordinator package deal, with Coughlin as a short term answer to stabilizing the franchise, with McAdoo potentially waiting in the wings once Coughlin is ready to retire? 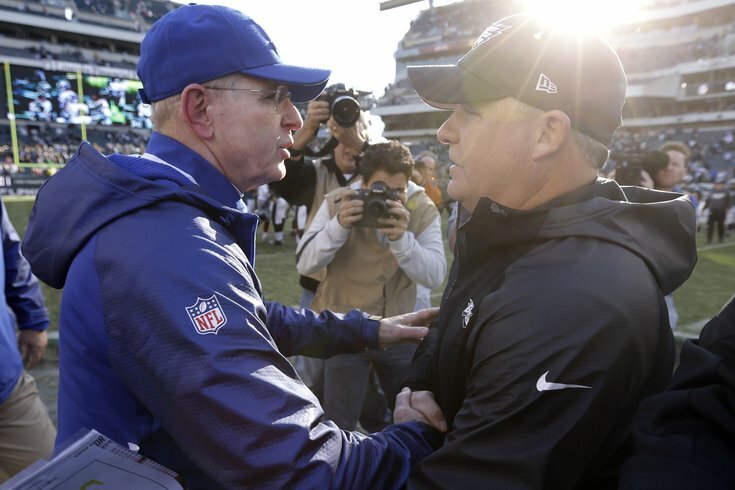 Or is it possible that the Eagles have some other sort of advisory role in mind for Coughlin. As noted by Mike Garafolo of FOX Sports, Coughlin has four children and 11 grandchildren who all live on the East Coast, and the Eagles' facilities are a short hour and a half drive away from the Giants', which makes the Eagles appealing solely from a geographical standpoint. It's getting weird now. Who will be interviewee number seven? Who do you want to be the Eagles' next head coach?